Please follow this links to view the presentations / photos. 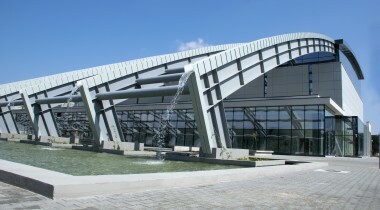 ELI-NP (Extreme light Infrastructure - Nuclear Physics), in collaboration with CERN (The European Organization for Nuclear Research), ERF (The European Association of National Research Facilities), ESS (The European Spallation Source), and ARIES (The Accelerator Research and Innovation for European Science and Society), will host on 23-24 November 2017, in Magurele, the forth Workshop on Energy for Sustainable Science at Research Infrastructures Facilities. Volatile energy costs, a tight budget climate and increasing environmental concerns are all inciting large-scale research facilities across the globe to devise mid- and long-term strategies for sustainable developments at their research infrastructures, including the aim for reliable, affordable and carbon-neutral energy supplies. This workshop will bring together international sustainability experts, stakeholders and representatives from research facilities and future research infrastructure projects all over the world. One of the main goals of this event is to identify the challenges, best practices and policies to develop and implement sustainable solutions at research infrastructures. This includes the increase of energy efficiencies, energy system optimizations, storage and savings, implementation and management issues as well as the review of challenges represented by potential future technological solutions and the tools for effective collaboration. 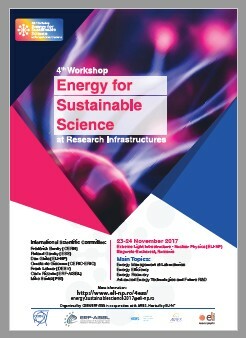 This workshop is the latest event of the series "Energy for Sustainable Science at Research Infrastructures" that is organized by ERF, CERN, ESS and ARIES, holding biennial workshops at various places. The first workshop was held at Lund, Sweden on 13-14 October 2011. The second one at CERN on 23-25 October 2013. The third workshop was hosted by In Hamburg, on 29-30 October 2015.